Uno Moo is a preschooler version of Uno that caters toward children aged 3 to 6 years old. Since younger children are not able to grasp the concept of the rules of some games, Uno Moo simplifies everything for them. There are no cards for their small hands to hold or for them to keep track of. The game uses small, plastic animal figures shaped like barn animals with stickers over the face to indicate what animal they are. 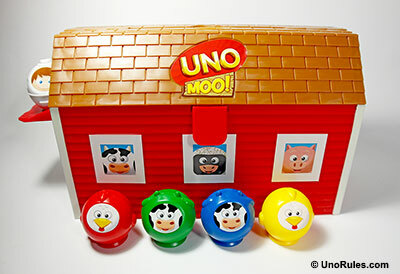 Uno Moo is basically a farm animal matching game where you round them up by matching the colors or the animals. There are two special figures in Uno Moo. Skunk – Skunks act as Skips. Skunks can only be played if the skunk matches in color, or there is another skunk on the Barn Door. If you play a skunk, the next player will have to skip their turn. Farmer – Farmers act as Wilds. Farmers can be played anytime on your turn, since they can match any figure on the Barn Door. If you play a farmer, you must also choose the color to continue play. 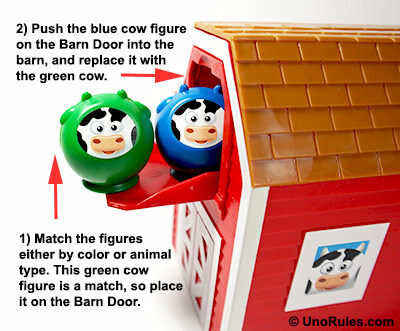 If a farmer is the first figure placed on the Barn Door at the start of the game, the first player can choose any color to begin the game. Uno Moo figure examples. From Left to Right (Yellow sheep, blue cow, farmer, red pig, blue chicken, and a green skunk). With Uno Moo, you can start playing right out of the box. 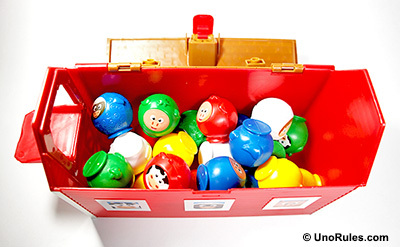 The latest version of Uno Moo consists of just 24 figures and a Barn (basically a box that can contain all the figures within). Previously, Uno Moo had 28 figures and “haystacks" for each player to hide their animal figures. First put all the 24 figures into the Barn and mix them up. Each player then puts their hand into the barn and without looking inside, takes out 5 figures. A random animal piece is taken out from the barn and placed on the Barn Door. The first player (usually the youngest player in the group), compares that animal with the ones that he/she has, and see if any matches. The figures are matched by either color or animal type. For example, if the animal on the Barn Door is a red sheep, the first player would either have to have a sheep to replace it, or match the color red from any animals they have. If there is a match, push the figure on Barn Door into the Barn, and replace it with your figure. If the first player does not have an animal they can play, they have to draw an animal out of the barn. If the piece they picked still cannot be played, play moves on to the next player. Take note of two special figure types – The skunk which serves as a Skip, and the white color farmers, which act as Wilds. The game continues in turn in a clockwise manner with each child knocking down the animal on the Barn Door and replacing it with the same animal or color that they have in their hands. The game keeps going until a player has successfully played all the animals in their hand and they are all inside the Barn. The first player to do this, wins the game. A player who has one sole remaining animal behind his/her haystack must shout “Uno Moo!" aloud. If another player catches them with one animal before saying the phrase, they must add two more animals from the barn to their hands as a penalty. Uno Moo may be a fun game for children but it also helps them learn. Children can learn gamesmanship and sportsmanship just from this game. The short duration of the game is a real help for young children who have difficulty paying attention. The game also helps develop memory and observation in young children. Children can have fun knocking the animals of the other players into the barn and also they can play with the animals behind their haystack until it is their turn. Uno Moo is physically interactive so children always have something to do. Even when the game is over, the animals all fit back into the barn and children can take the barn anywhere to use them to play something else entirely. And even their older siblings can enjoy playing Uno Moo. It’s fun for the whole family and a great way to have a family game night.